Date palms produce 1- to 3-inch-long sweet fruits that hang from the trees in long strands. Ripening in midsummer, each tree produces an abundance of ripe fruit. You can reap the bounty from your palms even if you only have one or two landscaping trees or are growing potted pygmy date palms. The palms are naturally pollinated by wind and insects as long as there are both male and female trees nearby. Proper harvesting ensures the fruit is picked at its ripest. Wrap the date bunches once they reach yellow or red in color so that any early ripening dates are caught before they fall to the ground. Wrap the bunches in a piece of bird netting or other strong, breathable fabric mesh. Cut down the bunch once most of the dates have darkened and begun turning brown. Cut through the thick stalk that holds the strands of fruit to the tree with a pruning saw. Remove the netting. Hold the date bunch over a large tub and shake it vigorously. Ripe dates break loose from the bunch and land in the tub. Remove any ripe dates from the netting and place these in the tub. Pick the remaining unripened dates from the strands and spread these out in a single layer on a tray or in a shallow box. Place the box in a warm area that does not receive direct sunlight. The dates should finish ripening within one week. 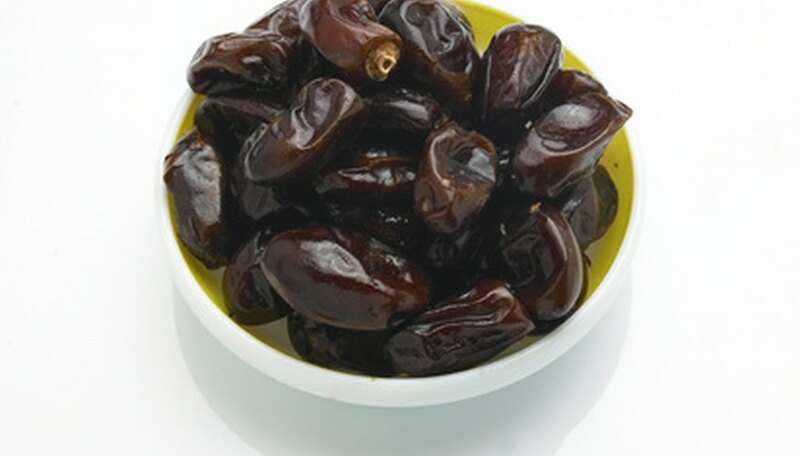 Store unripened dates for up to eight weeks in somewhere with a temperature of 32 to 34 degrees F. Store ripe dates for up to one year at this temperature. Pick the dates from the bunches as they ripen instead of cutting down the entire bunch, if you prefer. Netting also helps prevent birds and insects from feeding on the ripening fruits. Tall trees may require special ladders or equipment to reach the dates, such as a cherry picker.